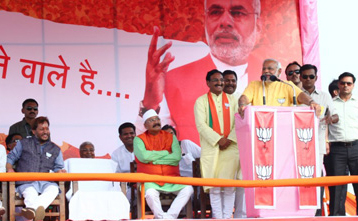 3rd May, Shri Narendra Modi addressed massive rallies at Srinagar, Almora, Rudrapur and Roorkee in Uttarakhand, and affirmed of the BJP’s focus on evolving a separate development strategy for the Himalayan states, which would embrace the strengths of the region and address its weaknesses. Shri Modi exposed the divisiveness of the Congress and urged the people to vote them out and enable the BJP to form a development-oriented government at the Centre. Shri Modi spoke of how the Congress and its allies were only focused on stopping Modi, be it by ‘gathbandhan’ or ‘lathbandhan’. And this, he said, was because of their fear for their fate after the declaration of results on 16th May. He attacked the misgovernance of the Mother-Son led government in Delhi and the Husband-Wife led government (referring to CM Harish Rawat and his wife Renuka) in Uttarakhand, and said, “Does Congress not have a single leader or Karyakarta or woman leader? Why is it that in Delhi there is Mother-Son & here Husband-Wife.” He further stated how Shri Rawat was also the incharge of Water Resources in his capacity as a Central government Minister earlier, but did little towards flood water management during the natural calamity that struck the State few months back. Retaliating strongly to the Congress Vice President’s statement of Shri Modi practising the politics of anger, Shri Modi questioned if getting angry on those who looted the Nation was wrong. He further cited various instances of the Congress ill-treating people, including Shri Rajiv Gandhi insulting former Andhra CM Tanguturi Anjaiah, the ousting of Shri Sitaram Kesri from the Congress office by the guards of Smt. Sonia Gandhi, and the Congress’ refusal to honour its leader Shri Narasimha Rao after his death, and said, “Rahul ji, we do not raise points on your family but you keep abusing me. People will give you the answer through the button,” said Shri Modi. Corruption by the Central government had wrecked the Nation’s progress, said Shri Modi, even as the affirmed of the BJP’s undivided focus to bring back the black money stashed in foreign banks by the Central government. In Srinagar, Shri Modi also thanked the women for attending the rally in large numbers, and drew their notice to how the safety of women, under the Congress rule, was under serious threat. He cited the report on ‘Dignity of Women’ which put forth that amongst the top 10 states with maximum atrocities on women, 7 were Congress-ruled. Affirming of the BJP’s emphasis on farmers’ welfare in the Terai region, Shri Modi stated the inclusion of a standardized quotient for determining the Minimum Support Price for the farm produce, in the BJP’s Manifesto. This, he said, would reinstate the mantra of ‘Jai Jawan, Jai Kisan’. He also spoke of the immense yet untapped potential of tourism in the country and stated how Uttarakhand could also elicit a large number of tourists. He asserted the BJP’s commitment to develop every region with separate development modules, incorporating the strengths and weaknesses of that region, and this would include a different growth policy for the states in the Himalayan range. Shri Modi recalled his early years spent in Uttarakhand as an organisation worker. He also spoke of how he had visited the region during the natural calamity in June last year, wishing to serve the people, but had to leave soon due to unwarranted political intrusion. Urging the people to end the misrule of the Congress, Shri Modi appealed to them to vote for the BJP in large numbers and ensure a strong and stable government in Delhi. He affirmed that he would serve the people by being their ‘sevak’ and the ‘chowkidaar’ of the country’s reserves. Former Uttarakhand Chief Minister Major-General (Retd.) Bhuwan Chand Khanduri was present during the rally at Srinagar. He spoke of how Shri Modi had extended a helping hand generously during the natural calamity that hit the State last year, and affirmed of the people’s wish to see Shri Modi as the PM of India. Shri Bhagat Singh Koshiyari was present during the rally at Almora and Shri Satpal Maharaj and Shri Ramesh Pokhriyal was present during the rally at Roorkee.